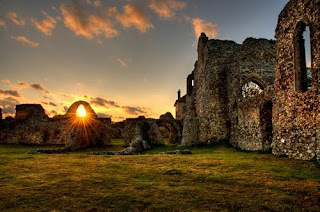 In the ruins of Leiston Abbey near the Abbey chapel in Suffolk, England, archaeologists discovered the remains of a male canine weighing 200lbs. and standing 7 feet tall. The creature's grave was thirty inches deep and it's skeleton was surrounded by various pieces of pottery. This is believed to be the body of the Black Shuck. Ancient tales tell of a 'giant hellhound with reddish burning eyes' attacking and killing people in East Anglia during the 16th century. The Black Shuck was greatly feared after it showed up during a violent storm on August 4, 1577 and bursts into the Holy Trinity Church in Blythburgh, about seven miles from Leiston in Suffok, killing two people as they were kneeling down to pray! Go HERE for more on the story. 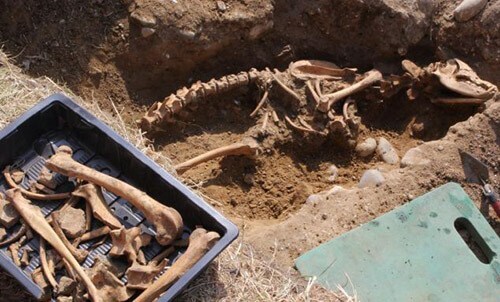 Hopefully the body will be studied more and we can learn how the giant dog died. 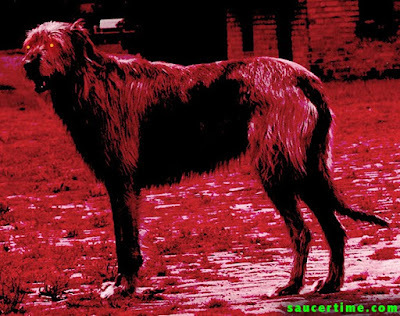 If the residents of East Anglia truly believed the Black Shuck (meaning 'black demon' in old English) was sent from Hell, then that might make sense of why it's remains were found buried on holy ground. The people wanted to make sure the murdering hellhound would never rise from the dead to hunt again.